Information Antigonish Town & County Library is one of seven branches in our regional library system and is located on Main Street (next to the movie theatre). The Antigonish County Adult Learning Association (ACALA) is also located in the library building, and have offices and classroom space in the library. The Antigonish Library is a wireless hotspot (WIFI) with access to high speed Internet. Books for all ages and interests, reference, large print book, DVDs/videos, magazines, audiobooks, Playaways, downloadable audiobooks, ebooks and emagazines, online databases & instructional programs (such as Ancestry.ca, Rocket Languages, Chilton's Library) and more. Programming, Reader's advisory, reference, inter-library loan, public Internet access, Makerspace, printer, scanner, 3Dprinter, family play packs, Nordic walking poles, and instructional tours available upon request. The Antigonish Library also has a very large Public Art display area, that is available for displays. For more information, please contact the library. An after hours bookdrop and 24-hour checkout is available at the Library entrance. All library programs are offered free of charge, although space is limited – so please call the Library for more information, and to register (902-863-4276). These regular library programs are offered through the fall until the spring (from September – June) while over the summer months, special programming (such as the Summer Reading Clubs for children) is offered. Throughout the year, special programs are also offered such as workshops, and presentations on a variety of topics. For more information, please visit: www.parl.ns.ca/events . - Community Café, a ‘drop-in as you wish’ program - on the 1st Wednesday of the month, at 2:00pm - with light refreshments, an interesting presentation. - Armchair Travelers, a ‘drop-in as you wish’ program - on the 2nd Thursday of the month, at 7:00pm - with guest presentations by travelers from around the world. - Knitting Circle, a 'drop-in' weekly program held Wednesdays at 2:00pm. 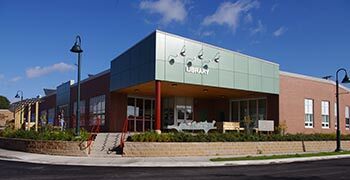 The Pictou-Antigonish Regional Library Board will provide non-profit groups with meeting space free of charge in the Library's Community & Meeting Rooms, when not in use for library activities. These meetings are to be of a non-fund raising, non-revenue generating nature. The Board reserves the right to accept or reject requests for the use of meeting space. For more information, please call the library (902-863-4276). The Antigonish Library has a large Community Room available for reservations, with an adjoining community kitchen and outdoor patio. In addition, this library also has a smaller meeting room space, and a small community office that are also available for reservations.